The bird of prey series produced by Cheshire-based Antony is based upon images that I have captured and display within my portfolio, and has already resulted in an incredible pencilled reproduction of the Saker Falcon. If you missed the first article be sure to check it out here. #1 - Since the first creation we saw of the Saker Falcon, what else have you been working on? 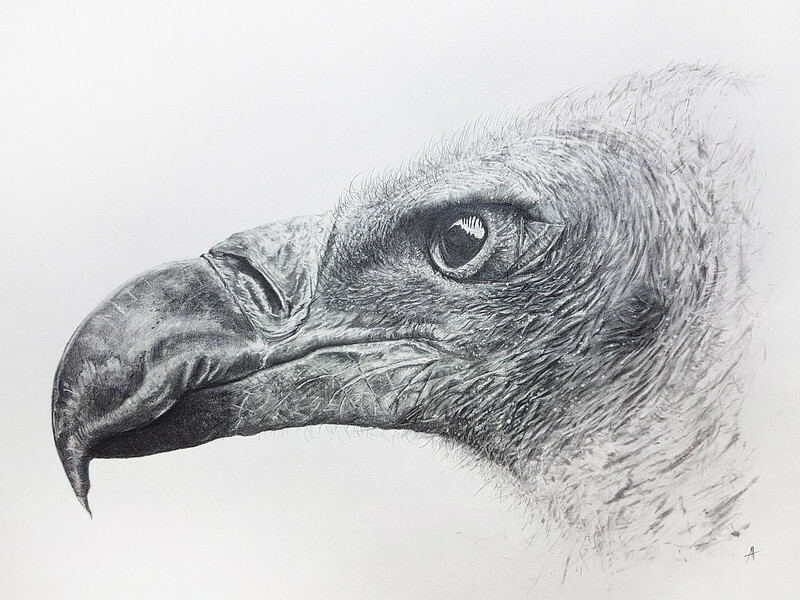 There have been a few projects in the works and I've recently completed 'White Backed Vulture' which is the second piece in the birds of prey series. I've also been fortunate enough to have several private commissions to enjoy, and in between I try and squeeze some graphic illustration bits for my eldest daughters school and Parent Teacher Association! #2 - Are there any challenges you faced when working on the latest artwork of the White Backed Vulture? The funny thing about any creative project (which I know you have an appreciation of Aaron!) is 'challenges' seem to ebb and flow between the demanding, mildly concerning or troublesome right through to entertaining, absorbing and outright fun! Obviously they change with each project but I would say that the biggest challenge any artist faces is when is enough, enough? Knowing when to leave well alone and move on to another aspect or indeed call it complete. #3 - Do you have a reason behind the images you chose to base your works on? I think this is always a difficult question to answer because there is no one criteria that I select them by. I would say that for each of the projects I work on, the reference images have one or more aspects which have captivated me in some way; detailed textures in skin, feather or bill for example, and in turn I am driven to convey that same feeling in my drawings. Working on commissions means there are inevitably tighter constraints with regard to reference imagery, which makes it an adventure of it's own. #4 - Can people purchase prints of your work or commission you as an artist? Absolutely! I'm currently creating a new portfolio site which will have a shop section to purchase prints. I can be contacted via email, twitter or Facebook for commissions enquiries - links can be found at the bottom of this article. #5 - What new projects and exhibitions do you have coming up or planned for the future? The next 12 months hopefully have lots more commissions, the completion of my birds of prey series and delving into the local artisan markets, art trails and exhibitions. If you'd like to see more of the work Antony has created be sure to follow him on Twitter and for commissions please contact Antony directly via info@antonyhowardpoynton.co.uk!